Accepted Scientific Name: Eriosyce subgibbosa (Haw.) Katt. Origin and Habitat: Eriosyce subgibbosa is endemic to coastal Chile where it occurs in the regions of Biobio, Maule, O´Higgins, Valparaiso, Coquimbo and Atacama. Altitude: It grows at elevations of 0 to 300 metres above sea level. Habitat: Grows on rocky outcrop on costal terraces cliffs, slopes, often hanging from rocks in sclerophyllous forest, from areas with very arid Mediterranean climate to areas of transition between Mediterranean climate and humid forest. The species is common and abundant, and the population seems to be stable. The major threat is illegal collection and urbanization in tourism areas, but these are localized impacts. Chilenia acutissima (Otto & A.Dietr.) Backeb. 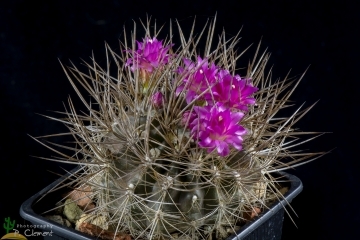 Echinocactus acutissimus Otto & A.Dietr. Chilenia castaneoides (Cels ex Salm-Dyck) Backeb. 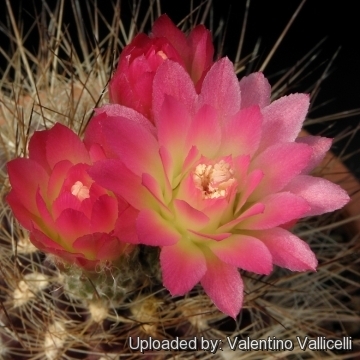 Neoporteria castaneoides (Cels ex Salm-Dyck) Werderm. 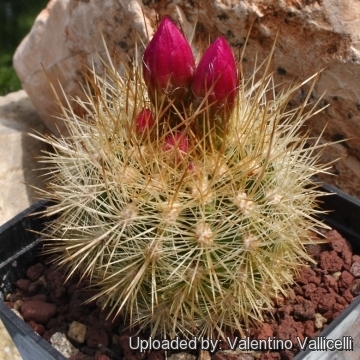 Echinocactus exsculptus Otto ex Pfeiff. Eriosyce subgibbosa var. litoralis (F.Ritter) Katt. Neoporteria subgibbosa var. intermedia (F.Ritter) A.E.Hoffm. Neoporteria subgibbosa var. litoralis (F.Ritter) A.E.Hoffm. Chilenia nigrihorrida var. major Backeb. Neoporteria nigrihorrida var. major Backeb. Neoporteria wagenknechtii var. microsperma (F.Ritter) A.E.Hoffm. Chilenia nigrihorrida var. minor Backeb. Neoporteria nigrihorrida var. minor Backeb. Eriosyce subgibbosa subs. clavata (Söhrens ex K.Schum.) Katt. Neoporteria clavata (Söhrens ex K.Schum.) Werderm. Eriosyce subgibbosa var. nigrihorrida (Backeb. ex A.W.Hill) Katt. Eriosyce subgibbosa subs. nigrihorrida (Backeb. ex A.W.Hill) Katt. Neoporteria clavata var. nigrihorrida (Backeb.) A.E.Hoffm. 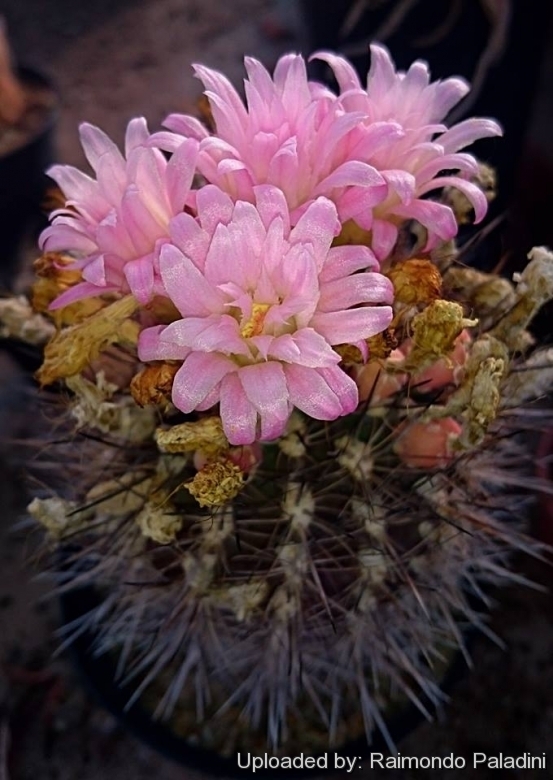 Neoporteria nigrihorrida (Backeb. ex A.W.Hill) Backeb. Eriosyce subgibbosa subs. vallenarensis (F.Ritter) Katt. Neoporteria subgibbosa var. vallenarensis (F.Ritter) Katt. Neoporteria wagenknechtii var. vallenarensis (F.Ritter) A.E.Hoffm. Eriosyce subgibbosa subs. wagenknechtii (F.Ritter) Katt. Neoporteria jussieui var. wagenknechtii (F.Ritter) A.E.Hoffm. Eriosyce nigrihorrida var. parviflora (F.Ritter) hort. 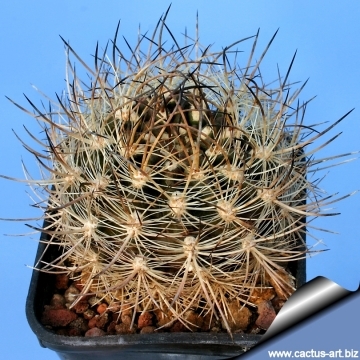 Description: Eriosyce subgibbosa much better known under its old name, Neoporteria subgibbosa, is a very variable species that has received numerous names. It is one of the few species that forms cylindrical stems. Four subspecies are recognized, the nominate form, subsp. clavata (K.Schum.) Katt., subsp. vallenarensis (F.Ritter) Katt. and subsp. wagenknechtii (F.Ritter) Katt. Habit: Solitary, but sometimes branched, columnar perennial cactus erect or somewhat procumbent when long. Stem: Globular to columnar, up to 90 cm tall (or more), up to 10 cm wide. Grey-green, yellowish-green, brownish-green or blackish-green. Ribs: (11-)16-20(-22) more or less notched with chinlike protrusions. Spines: Partially hiding the ribs, needle like, more or less long and dense, white, yellowish, golden yellow, brown, or nearly black, while older one became greyish. Radial spines: (8-)16-24(-40), 1-2(-3) cm long, radiating. Central spines: 4 to 8, occasionally up to 16, stronger, up to 4 cm long,straight or recurved and spreading, often darker at the tips.. Flower: Pretty relatively small up to about 3-5(-6) cm long, bi-coloured with magenta, rose to the violet petal tips and pinkish-white, white or yellowish-white throat, giving the sensation of being fluorescent and being very difficult to photograph in good conditions because that particularity. Inner tepals erect, acute, concealing the stamens. Blooming season: Blooms early in late winter to spring. It is advisable to leave them dry from middle of November to obtain fantastic flowering later in January/March. Fruits: Ovoid to cylindrical, 1,5-2 cm long, 1 cm in diameter, red or reddish-green partly hollow at maturity, only scarcely woolly, apical areoles not spinescent. Remarks: This species has many (very controversial) varieties. Eriosyce subgibbosa (Haw.) Katt. : This is the form with more elongated stems, with 8 to 30 thin, acicular, radial spines per areole, spines often yellowish. Eriosyce subgibbosa var. castanea (F.Ritter) Katt. : It has thin short and acicular radial spines and globose stems that will sometimes offset. 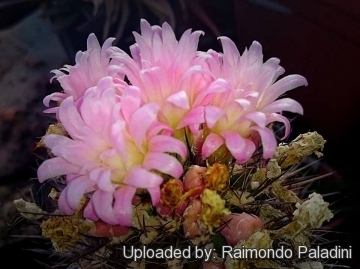 The flowers can get up to 6 cm long (the larger among the "subgibbosa" forms). Eriosyce subgibbosa subs. clavata (Söhrens ex K.Schum.) Katt. : It has from 11 to 13 thick radial spines per areole and slender stems. Eriosyce subgibbosa var. litoralis (F.Ritter) Katt. 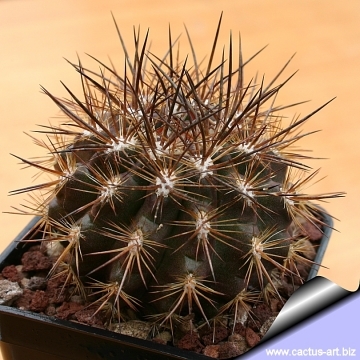 : It is very spiny and has from 30 to 40 hairlike radial spines per areole it grows in the rocks. Eriosyce subgibbosa var. nigrihorrida (Backeb. ex A.W.Hill) Katt. : has globose blackish-green body and stout straight spines which are pitch-black in the crown. The flowers are bi-coloured with carmine petal tips and yellowish-white throat. Distribution: South Coquimbo. 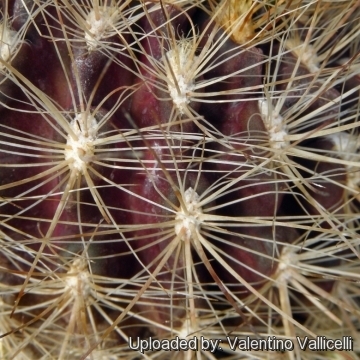 Eriosyce subgibbosa f. rapifera (F.Ritter & Y.Itô): has a purple body with black spines and a swollen carrot like root. Distribution: la Serena and adjacent areas. Eriosyce subgibbosa var. vallenarensis (F.Ritter) Katt. : It has from 9 to 24 thin & straight radial spine per areole and slender stems. Eriosyce subgibbosa var. wagenknechtii (F.Ritter) Katt. : has fewer ribs and smaller flowers less tha 3 cm long. It has dark-grey or blackish spines. Distribution: la Serena and adjacent areas. Eriosyce subgibbosa var. wagenknechtii f. napina (F.Ritter): has a swollen carrot like root often much larger than the standard stem. Distribution: la Serena and adjacent areas. Neoporteria cachitaensis n.n., catalog name: Distribution: Cachita (East of Taltal), region 02 Antofagasta, Chile. Neoporteria clavata f. procera F.Ritter: Has stouter dark recurved spines. Distribution: Cerro Grande, altitude 300-500 m.
10) Faundez, L., Guerrero, P., Saldivia, P. & Walter, H.E. 2013. Eriosyce subgibbosa. In: IUCN 2013. "IUCN Red List of Threatened Species." Version 2013.2. <www.iucnredlist.org>. Downloaded on 16 January 2014. 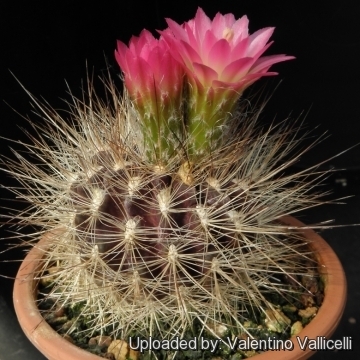 Cultivation and Propagation: It is a summer-growing species of relatively easy cultivation that continues to be, a particular prize among collectors. This plant is extremely xerophytic, adapted to very dry soils and is quite susceptible to over-watering if kept in a non ventilated place.